New Retevis Black High Quality 2 Pin PTT MIC Noise Reduction Covert Acoustic Tube In-ear Earpiece Headset for Radio Retevis KENWOOD PUXING QUANSHENG TYT HYT BAOFENG BF-UV5R 888S H777. 50 X 2 Pin PTT MIC Covert Acoustic Tube Earpiece Headset for Retevis KENWOOD Radio. 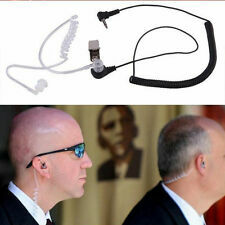 1 x SIA 2 Pin Security Earpiece Headset. Microphone Size: 6.0 X 5.0mm. Hidden microphone inside PTT switch. Compatible with Motorola SMP Series :SMP818 SMP308 SMP328. Speaker DIA: 22MM. Transparent flexible acoustic tube. 1 pair Black Gel Covert Open Ear Insert Earmold. 1x Black Coiled Accoustic Tube for Two-way Radio Surveillance-Style Earpieces. For use with most Coil Tube Audio Kits, either Left or Right Ear. Includes tube, silicone tip, and twist on connector. Box includes ; Inked Collared Fully Functional Bluetooth Earbuds, Charging Cable, Extra Ear Pads, Instruction Manual. Boxes have been re-taped to secure product. Just simply let us know. We find creative ways to acquire great deals. Swivel Earpiece with Microphone and PTT for Motorola 2 Way Radio Walkie Talkie for HKLN4604a HKLN4604 RLN6423. Built-in microphone with a comfortable PTT(Push to Talk) button that can be clipped onto your shirt, lapel or tie, you communication will be easy and discreet. Walkie Talkie with. Baofeng BF-88A/88E. Ham Wallie Talkie Two-way Radio. BAOFENG UV5R, UV5RA, UV5RB, UV5RC, UV5RE, UV5RA , UV5R UV3R UV5 UV6 V85 B5 B6, DM-5R, DM-5R Plus. KENWOOD -Talk, Pro-Power Free-Talk, Protalk XLS. 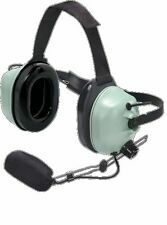 U94 type Headset PTT. And for TYT F8, BAOFENG UV5R, MML UV100, etc. Connector: 2 pin kenwood type connector. Compatible Ham Radio Model Fit military standard version plug. UV5R V2 UV5RA/plus UV5RB UV5RC UV5RE/plus UV-B5 UV-B6 UV-82 GT-3 UV8 D UV3R Plus (not for UV-3R). FlexSport Collar w/ Built-in Mic and Remote. Mic: Yes. Wireless Range: 33 ft. Wireless: Yes. Charging Cable. Box Contents. XPR3300 XPR3500 XPR3300e XPR3500e. PMLN7269 2-WIRE SURVEILLANCE KIT. Designed with the earpiece located on one wire and the microphone and push-to-talk on the second wire. 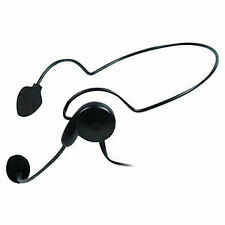 Ideal for overt operations, personnel can fasten the microphone to their uniform where it’s easily accessible. 1 Pin with 2.5mm Plug, Works for Most Walkie Talkie with 2.5mm jack. 2 x Earpiece For Motorola. Compatible Motorola Models Spirit GT / GT plus, FR50, FR60. TKLR T3, TKLR T4, TLKR T5, TLKR T7. USA STOCK, USPS SHIPPING, FAST AND SAFE! Earplug can be rotated left and right ears and wear comfortably. Covert Acoustic Tube Earphone For Kenwood. Kenwood KPG. Kenwood TH. Kenwood TK. Mic 2.5mm stereo (bottom pin). 10 X 2 PIN Earpiece MIC Headset For KENWOO. Compatible for HYT. Earpiece Type. Covert Acoustic Tube Earphone For motorola. 5 x Retevis 2Pin PTT Mic Covert Acoustic Tube Earpiece Headset For Motorola. Length of the cable(Plug to PTT): Approx 39.4in(100cm);PTT to Acoustic Tube:Approx:23.6in(60cm). The Sport Pulse from Jabra are wireless Bluetooth earphones designed as an all-in-one training solution with a built-in heart rate monitor that's optimized for running with an integrated running app. Jabra Elite 25e Wireless Bluetooth Earbuds for Music and Calls Black NEW. JBL E65BTNC Wireless Noise-Cancelling Over-the-Ear Headphones. Enables simple wireless pairing with your Bluetooth-enabled device. Noise cancellation. Wireless Connectivity. USER MANUAL. Noise Canceling. Trending at $97.90eBay determines this price through a machine learned model of the product's sale prices within the last 90 days. 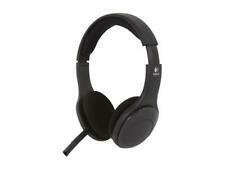 WI-C300 Sony Wireless Headphones - YouTube. Paste link into a browser window:[isdntekvideo]. • 2-pin clip on earpiece compatible with 2 -pin radio devices. • 1 x 2-Pin Earpiece Compatible with Radio Devices. • Hidden microphone inside PTT switch. (1)BaoFeng Two Way Radios 10 X Air tube reel cable Headset (2pin 2.5mm for Kenwood). Radiation-proof:Air acoustic tube protect your body by reducing radio waves radiation. TG-UV2,TG-K4AT(UV),TG-5A Plus. XPR7350 XPR7380 XPR7550 XPR7580. This surveillance kit includes an extended-wear comfort earpiece with rubber eartip and quick-disconnect, clear, comfortable acoustic tube. Users hear transmissions clearly, while the clear tube provides a discreet appearance. And for TYT F8, BAOFENG UV5R, MML UV100, etc. - Push-To-Talk (PTT) button on side. - Phone set used by Soldiers, especially in Vietnam those AN/PRC25 AN/PRC77, but designed to plug in for modern radios. 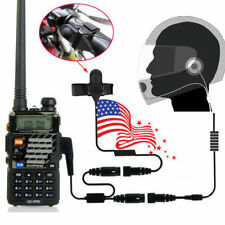 This is a headset of motorcycles, bicycles, ATV's for KENWOOD radios with 2 PIN connector. Has a remote microphone with push to talk button you can clip anywhere. For Ham Radio. Twin right angle: Ear 2.5mm stereo (top pin). It works on Baofeng UV5-R3 i e ( 72. They work on Baofeng! i e ( 72. Color: Black with transparent acoustic tubing. Soft plastic ear bud to fit snuggly in your ear with a transparent acoustic tube (extra ear bud included). ). NX200 NX300 NX210 NX410 NX411. 2 Pin Surveillance Kit Translucent Acoustic Tube Headset Earphone Earpiece For Kenwood. This surveillance kit includes an extended-wear comfort earpiece with rubber eartip and quick-disconnect, clear, comfortable acoustic tube. Tactical Peltor Style Military Headset Cable & PTT. Push To Talk Module. Compatible Ham Radio Model Military standard version plug. Item's Detail For Airsoft/Paintball use. And for TYT F8, BAOFENG UV5R, MML UV100, etc. 1 Piece Air Tube Earpiece. Most Radios with 3.5mm headset jack or Hand mic with 3.5mm headset jack. Can be used for Ipod, Ipod Nano, MP3 player, phone, CD player, portable FM AM radio, shoulder microphone, etc. US SELLER ..... FREE SHIPPING !!!!! New open boxed item that has been tested for quality and function. NOTHING TO HOLD YOU BACK: Forget what you thought you knew about truly wireless ear buds. MORE FUNCTIONS: Compatible with Android, iPhone, and all bluetooth devices. Bodyguard FBI Covert Earpiece Earphone Headset PTT(Push To Talk) with built-in line mic microphone for Motorola Radio XPR3300 XPR3500 XIR P6620 XIR P6600 E8600 E8608 MotoTRBO Security Door Supervisor. 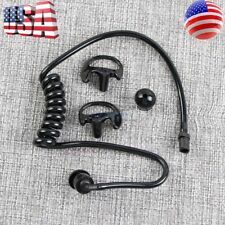 1 x New Premium Baofeng Earpiece Earphone Headset Mic. With this earpiece you can clip it onto your shirt and begin using your radio with no hands. 2-pin clip on earpiece compatible with 2 pin radio devices. IPHONE AND SAMSUNG COMPATIBLE: Compatible with any Bluetooth enabled device, including Apple iPhone and Samsung Galaxy. Skullcandy JIB Wireless. Bluetooth Earbuds W/ In-Line Microphone. NEW FACTORY SEALED BOX. Compatible with two way radios walkie talkie that required two pin plug. BaoFeng Radio: UV-5R ,BF-666S, BF-777S, BF-888S. 2× Walkie talkie Headset. PTT MIC Function: Has a remote microphone with push to talk button. 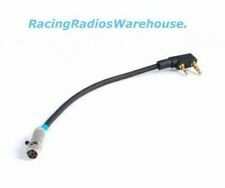 Racing Scanner Headset For Nascar - RE24 - NEW! The thin design follows the oval contour of your ear and sits naturally inside the ear canal. Their minimal size is reflected in their design and proves comfortable for hours of use. The X6i’s minimal design combines sturdy die-cast zinc for the front housing, optimally weighted to stay put inside your ear canal. THESE EARPIECES ARE RECEIVE ONLY AND MADE FOR USE WITH SPEAKER MICROPHONES THAT HAVE 3.5MM EARPHONE JACKS. 2-pin clip on earpiece compatible with 2 pin Motorola radio devices. Color: Black with transparent acoustic tubing. Soft plastic ear bud to fit snuggly in your ear with a transparent acoustic tube (extra ear bud included). 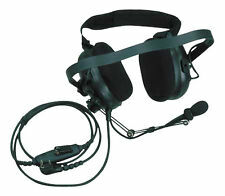 General aviation pilot headset with dual plugs & MP3 music input. The RA200 is packed full of features and high performance, making it the popular and affordable choice for pilots, instructors, passengers, flight schools, and student pilots. Gold-Plated 3.5mm Plug. Dynamic Speakers. Inline Mic and 3-Button Remote. 3.5mm Surveillance Plug Coil Tube Earbud Audio Kit for Two-way Radios. Fits two-way radios, radio speaker mics, MP3 players and similar devices with 3.5mm connector. 2-WAY RADIO Transceivers and Radio Speaker Mics. Without cord. 1/8" plug and 1/4" adapter. Mic Impedance: 600 ohms. Mic Range: 100 Hz - 20 kHz. Trending at $58.99eBay determines this price through a machine learned model of the product's sale prices within the last 90 days. Walkie talkies are a fun and sometimes necessary way to keep in touch with those in aren't close enough to speak to without yelling but are in close enough physical proximity to not require a telephone. Now you can talk on yours without having to hold the device to your face with this walkie talkie headset, available on eBay for various affordable prices depending on the model. How does this walkie talkie headset work? This headset comes with a small, wireless adapter that plugs into your walkie talkie. This adapter is then connected via Bluetooth to both your earpiece headset and push-to-talk remote control. Once successfully paired, you will receive messages from the other end of your walkie talkie in your earpiece. To make a call to the other walkie talkie, simply press the push-to-talk remote and speak into the earpiece's microphone. What comes with this walkie talkie headset? Where do you use this type of headset? This walkie talkie wireless headset is useful in situations where you need to inconspicuously communicate with others via walkie talkie. It could be used when security detail needs to speak to one another during events without alerting others. It is also useful for hunting when you need to speak to another person in your party without making much noise. This headset would be optimal if you were driving in a caravan and need to keep in close contact with others in that caravan. Since this device is compatible with most cell phones, tablets, and computers, it can be used for calls, meetings, or gaming. This could also allow you hands-free calling while driving. What are some of the specifications of this headset? All together, the kit weighs just 4.4 ounces, making it easy to carry along with you. It comes equipped with noise-isolation technology, allowing for crisp, clear sound. The earpiece has volume control right on it. It hooks over the back of the ear securely so you do not need to worry about it falling out. It has lights on the unit to indicate low battery, pairing status, and operating mode. The battery charges full in about 2 hours and gives you almost 6 hours of continuous talk time.